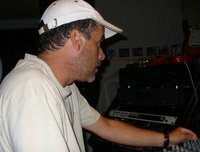 DCMIX (Daniel Coulombe) has been producing music and sound imaging, jingles, themes, etc... for more than 20 years. Starting as a D.J. in the mid 70's, DCMIX became renowned locally for his famous montages. Becoming a remixing engineer in the early 80's, bands like B-52's and Icehouse had remixes produced by DCMIX. Radio and jingles production started around the mid 80's becoming the main activity alongside song recording and remixing. DCMIX uses top technology and musicians to achieve its goals in his home studio located in beautiful Quebec city, Canada. The sound imaging collection consists of elements previously produced for many broadcasters and now available to new markets. DCMIX can also process and mix your vocal selection and of course, create and produce your next sound imaging. For more information about radio & television sound imaging, advertising jingles, music production for artists or disc jockey services, please contact us.